Tis the Season ! Christmas is right around the corner. Hope everyone has the best season ever. Time is going fast. The retirement life is wonderful. I thought it was going to be great and looked forward to it for a while but reality and wishing or dreaming about something is entirely different than experiencing it. I love not having to get up early to rush to work. I love the freedom each day to choose what you want to do. I love the never ending possibilities you can do. There has not been a day where I felt bored, or unmotivated. I have had a lot to do and it’s funny I still didn’t accomplish everything I had hoped for. There is a saying “I don’t know how I fitted everything in when I was working” . What happens is you prioritize, you work at the first come and don’t worry about something if it doesn’t get done as you always have tomorrow. You really can’t enjoy life if you are working everyday and only live on the weekends. It has been an amazing 9 months and I am looking forward to the next 30 years of been similar.I only miss the adrenalin rush of decision after decision in busy times that impact the companies financials and the customer service levels.I do miss the interaction between co-workers at the office. 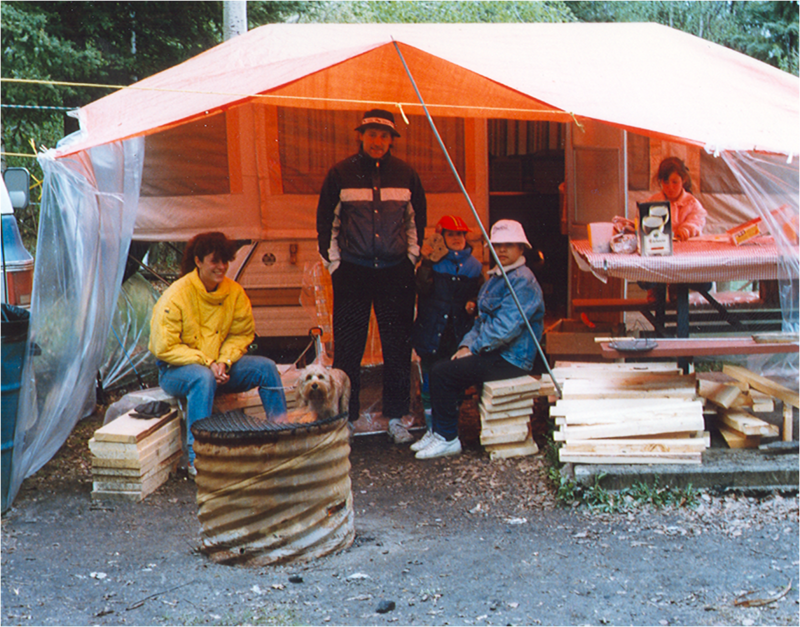 Fishing, golfing, helping family, helping friends, visiting with family and friends,camping,travelling and enjoying the freedom is amazing. The only concern a new retiree has is possibly money but as we don’t know how long we are here in this world you shouldn’t fret about it to much. You need to have careful planning and execution but to spend to much time worrying about it is counter productive. Remember the first 15 years will be in the higher spending bracket doing the things you enjoy and the later years you will be less inclined to travel etc and it will all balance out. As previously stated the banks and advisers are motivated by compensation to tell you to save more and more. You will not spend close to the 70% they estimate. We have done an amazing amount of things this year and are a way under that. This morning I think I will head over to the house we manage as a rental to inspect and look at fixing a few things and then off to Lethbridge tomorrow for flooring at Jessica’s place. November budget done with a over budget number but we had planned that with the 2K of renovations we put into the place plus a few repairs and purchases. Christmas set up I think will wait till Thursday or Friday unless I get done earlier today than thought. Nice to see the temperature rising. A balmy -9 today. Yahoo. By the age of 55, most of us have accomplished whatever work-related goals we are going to reach. If you haven’t done it by then, chances are you aren’t going to do it. Take the retirement, take the pension if you have one, take the CPP at 60 and sail off into the sunset and enjoy yourself. Retire and live life to it’s fullest. Discover things that you never had the time to do before. And don’t worry be happy ! puller bar to tighten the joints. This added a lot of extra time trying to get each board tight and flat to the next. It is one of those floors where you will not be able to slide a chair back over the joints as you could chip out the beveled edge. But all done except the caulk and paint of the room and it looks great. 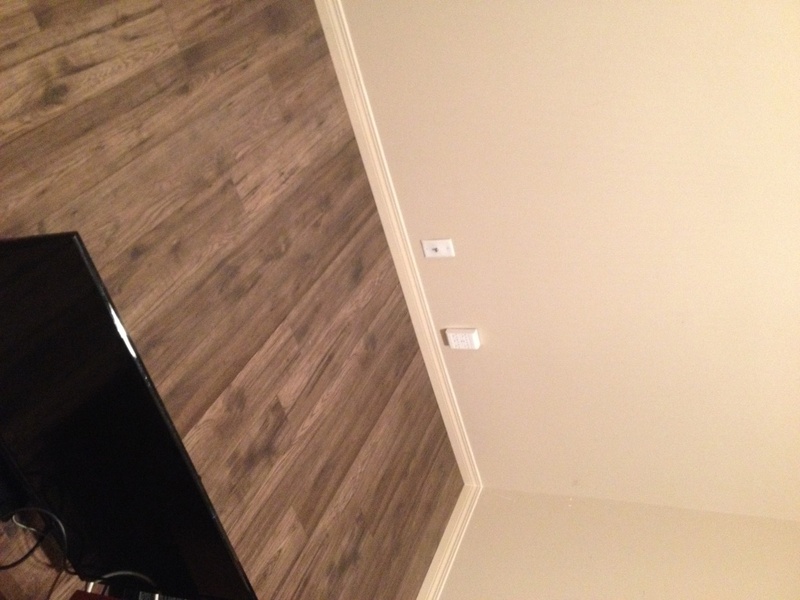 It is my favorite color of flooring.Jackie and I will go this weekend to complete the second room which is a little larger. Here’s hoping everything goes just a little easier and faster. I do know that two full days of up and down and on your knees sure does take it’s toll on the body when you are not used to it. 10 hours of straight work, up, down, measure, cut, pull and pull, hit, up down etc plus then another 5 hours. I had to cancel ,my golf outing tonight as I would just get back to Calgary around then. Too bad as I love the beer and wings after.The hyperspace computer ghost got to Jeff as I had sent him a text to let him know and he responded to that text on the same string but still showed up at the golf center. At least it isn’t miles away. I remember one time Paul went to the wrong golf course MILES away from a errand text string. Oh well next week golf and wings. What do you get if you run in front of a car? What do you get if you run behind a car? with Jackie between phone calls if she would like a smaller Christmas tree. 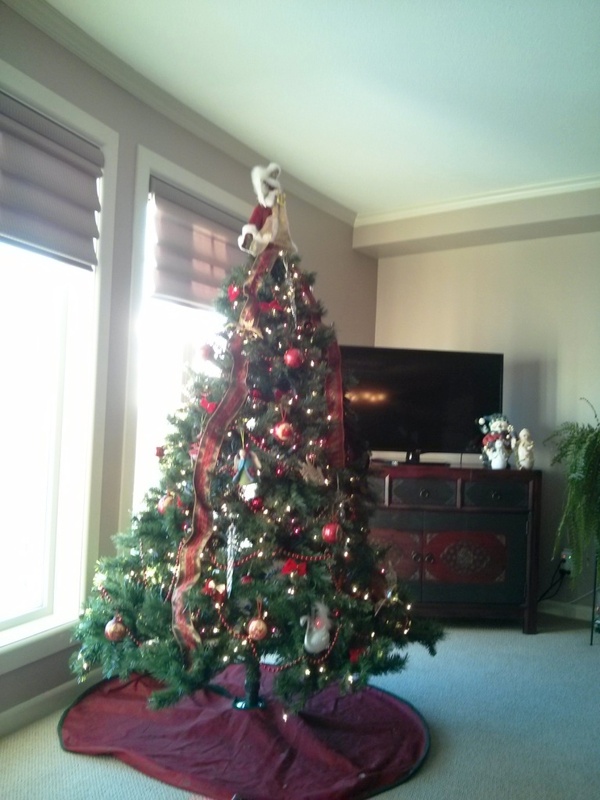 Our tree is 7 1/2 ft tall with over 800 bulbs on it and has at least a 5ft span. Plus it is heavy ! She agreed. So off to find a tree. 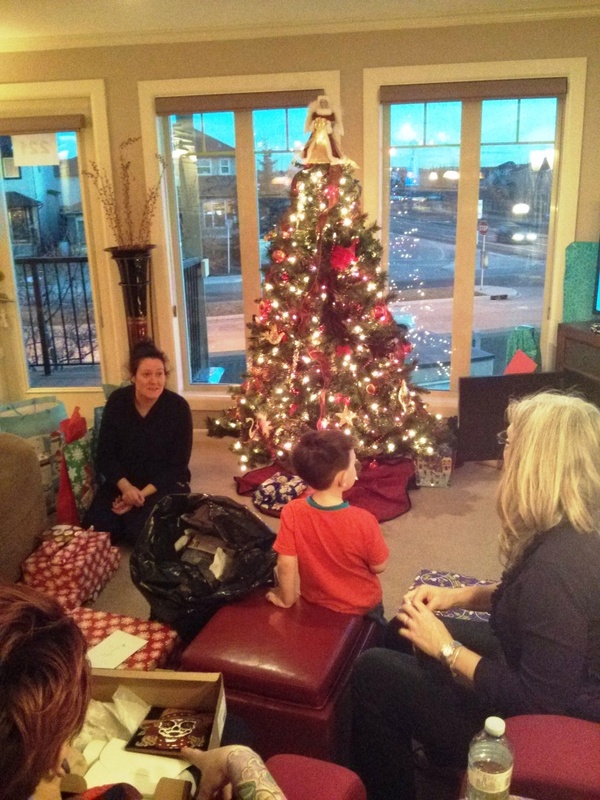 (memories- years ago in St Albert for our first Christmas there and we had very little money as we bought to much house I was asked to go get a tree. We used to get one from my parents acreage every year but they weren’t the best looking so off to the tree lot. I didn’t want a Charlie Brown tree so I ended up getting the most beautiful hand trimmed/shaped scotch pine tree 7ft high. $ 100 back in 1983. She wasn’t happy but after the tree was decorated she came around) This time I was downsizing. I ended up with a 6Ft fir artificial tree that is half the weight and size of our old one. Victoria had a girl at work that needed a tree so I emailed her to give her our old one. I only requested she send a picture after she decorated it. Does anyone remember popcorn strings for decorations ? Funny how things have changed as no one uses hand made ornaments anymore. The new tree fits a way better and I am sure the young girl will love her tree also. Got to love Christmas with it being so rich in customs and religion. Eggnog, spirits, gift sharing, Santa,fruitcake, turkey dinner,snappers,caroling, church on Christmas eve,Jesus’s birth,Christmas pudding, and the Christmas spirit everywhere. Finally hung our second last Tarkay painting which again we love. If only the third would show up. Nice to finally be done on our condo. I do see a major reno of Jess’s bathroom in the future though.The bad part about that is with only one shower in the house they need to plan for about three or so days of going somewhere else to shower. Bathrooms can also get fairly expensive with concrete backer board, tiles, glass doors, vanity, sink and taps for tub and sink. I am really looking forward to sitting on my patio table outside in 25 degree weather having a cold beer. 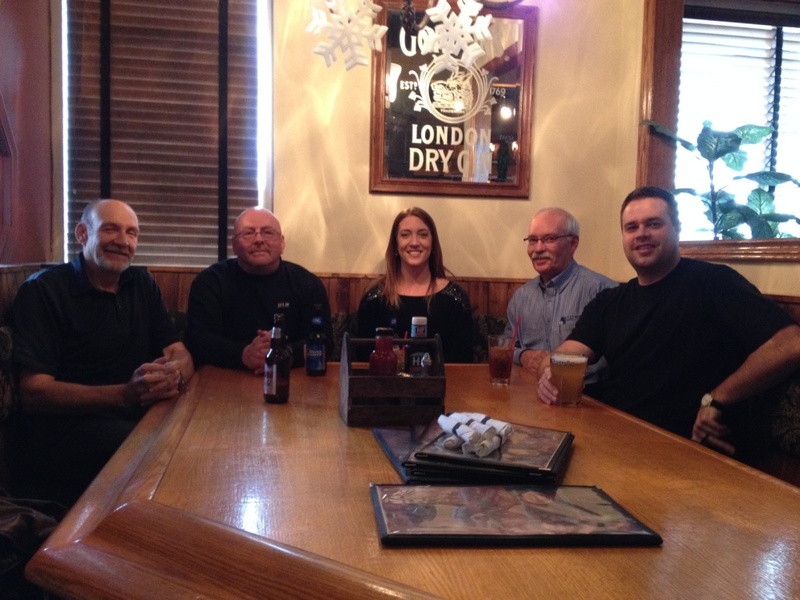 I am also looking forward to Fat Willy’s every Monday for a burger and beer with Fred & Terry in January and Keith & Jenny in February. I know Mom wants to come down to visit so we will need to figure out the way to make that work at the airport etc.It also looks like Victoria, Corey, Jackson and Jessica may come down in April to visit us also.Only 22 more days to go before I head. The one thing women don’t want to find in their stockings Christmas morning is their husband. I have about 5 dress suits left that I haven’t culled when we were closet cleaning in the past. As we used to have to wear them everyday to work you had have a few to save on the dry cleaning bills. I went to try them on this morning to get ready for the Scotia Bank Pensioners Christmas get together and was very surprised. These suits are a way way to big for me. Some of them may have had at least 4 inches extra around the waist. I won’t be wearing a suit today or anytime soon until I get a new one. ( Moore’s is cheaper to buy a new than to get resized) One suit today will work as the rarity of wearing them with only using them now for weddings or funerals or perhaps the odd Christmas party.Nice thing with the size reduction but can get expensive having to replace everything. I know you don’t want your bathing suit to be to big and slipping down. LOL .This will be Jackie’s first pensioner dinner for herself as I know she used to accompany her Mom to some in the past. Did you guys see the amazing hockey game again last night. Those Flames are fun to watch. Nice also that Hartley got his 400th win. Seems odd that the live span of a coach is less than 5 years in the NHL other than Al Arbour or Scotty Bowman. Victoria picked up the tree last night to take to work to her colleague to have. I hope that she really enjoys it. I hope to see a picture of it all decorated. Paid for my Turner Valley Golf membership today which I am going to use even more next year to save on spending money at other courses. This course is a first rate course at a very reasonable price for memberships and yearly. You need to play fairly often though to make it pay. Over 30 games and you have saved money plus the benefits of league play, priority booking times, reserved tee slot times and a bunch of fun guys. Very impressed with the Bank Of Nova Scotia.Today they held their annual pensioners Christmas lunch. There were 300 individuals in attendance and it was quite interesting to hear all of their retirement stories and what they are doing after working. Some are contracting a little,some are doing “easy jobs”, some volunteering and others just enjoying life. What is impressive is the bank recognizing the value and contribution of these people over the years. It is like one of the VP’s said in his speech ” we are Scotia Bankers for life, we are family”. That is an amazing philosophy that more companies should grab a hold of. Not only did we have a fantastic turkey dinner but it was a open bar and a large amount of prize give-aways all at no cost to the retirees. The Bank also had in attendance at least 6 very high profile management personnel like the Senior VP,and District VP’s taking the time out of their busy work schedule to socialize with the ex-employees. Retirees are or can be as I have stated before great ambassadors of a company and the companies appreciation of their work life with them is a testament to the moral compass of a great company. The careers of these people in that room are amazing with tenure of 20 yrs,30 yrs, 40 yrs and plus. I know everyone I talked to was very appreciative. 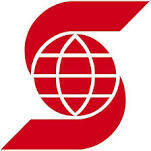 Makes me jealous a bit that I can’t experience the same thing.Way to go Scotia Bank. What to buy for Christmas on a retiree’s income ? Up a way way to to early and headed to Lethbridge to do the other bedroom and start the painting in one room. Jackie, Jess and I worked like mad removing the carpet, hauling it outside, removing the million staples from the under pad, removing the tack bars and baseboard. With their help for this room it was only a few hours compared to the last room taking me quite a few more. 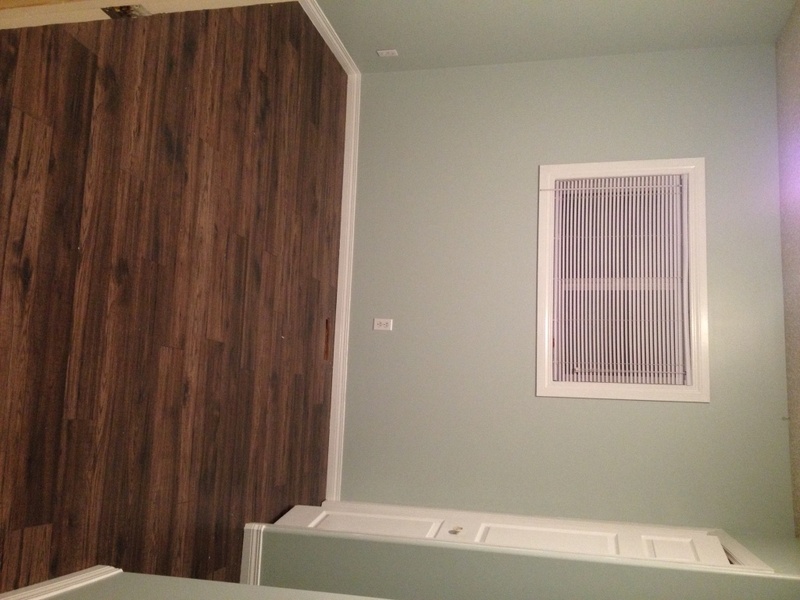 The outside wall was out by a 1″ or more after the addition so in this room I layed the planks perpendicular to the joists and with laminate it doesn’t really matter especially with a good subfloor. Starting laying the boards. Where the addition was added it turned out the floor had a bit of a hump in it. This caused me a lot of grief trying to keep the joints tight with this weaker locking system. Luckily right where I had to live with a few gaps is the centre of the bed so everything will be fine. After the hump everything went reasonable well again. Again wood glued baseboard is extremely difficult to get off without breaking them and takes a lot of extra time to have them ready to reinstall. plus threw out a lot of junk. Tired but happy with the results. 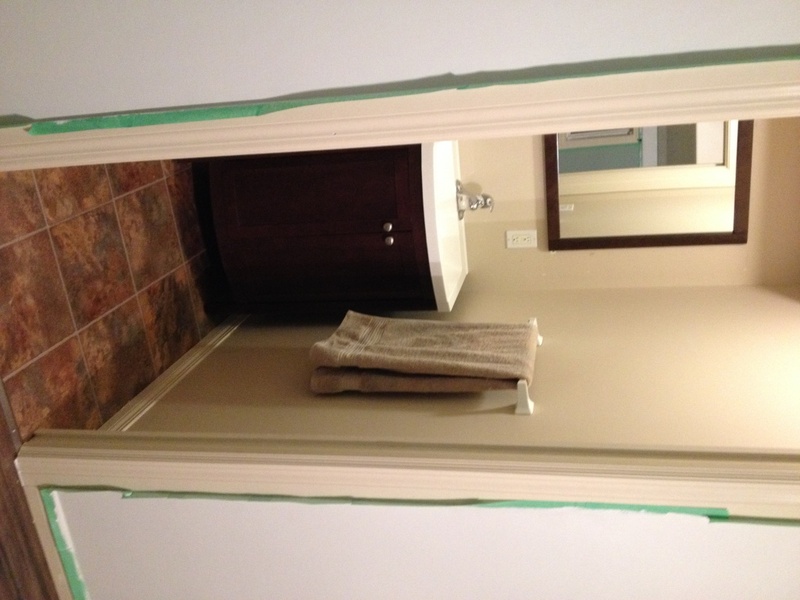 Next task is new flooring, vanity, taps and paint in the off bedroom washroom. This room will go from blah to spectacular.We had A& W a few times but with the calories burnt it won’t be an issue. Even Jackie today was grimacing from pain in the muscles. Just a mellow day today. Did a few things around the house. Went grocery shopping ( nice going during midweek with no one else in store ) , dropped off most of my tools at Victoria’s place and looked at bathroom vanities at Lowe’s and Depot for Jessica & Penny. After a great supper we decided we better get some Christmas shopping done. I hate shopping. I don’t like the money it costs, I don’t like the experience of being in a mall walking aimlessly, I don’t like trying to figure out what to get for people and if they will like it. That is why I like Thanksgiving 100 percent better than Christmas. The get together, great meal, company without all of the hoopla. I know talking to numerous people they all feel the extra stress at Christmas as they feel obligated to be at a parents place for Christmas, or another designated spot sometimes travelling hours and hours. Sometimes to many spots. I know years ago we had three Christmas dinners in two days.Never mind the gifts, the hours spent travelling and the extra cost of gas the experience is tiring and does remove some of the fun out of it. Jackie & I always tried to let our kids know we do not have that expectation and understand other family commitments. As families grow, change etc the experience becomes different not better or worse just different. I understand the feeling of wanting your family all together and Christmas is such a special time it is nice but I think we need to get away from the commercialism of Christmas to make it a even more enjoyable time. Did I say I hate shopping !!! I think next year I am going to try to become a on-line Christmas shopper to see how that goes. I think today I will make a chocolate pie , make my backer board for the towel bar in the rental house and enjoy the wonderful sunny Chinook day. 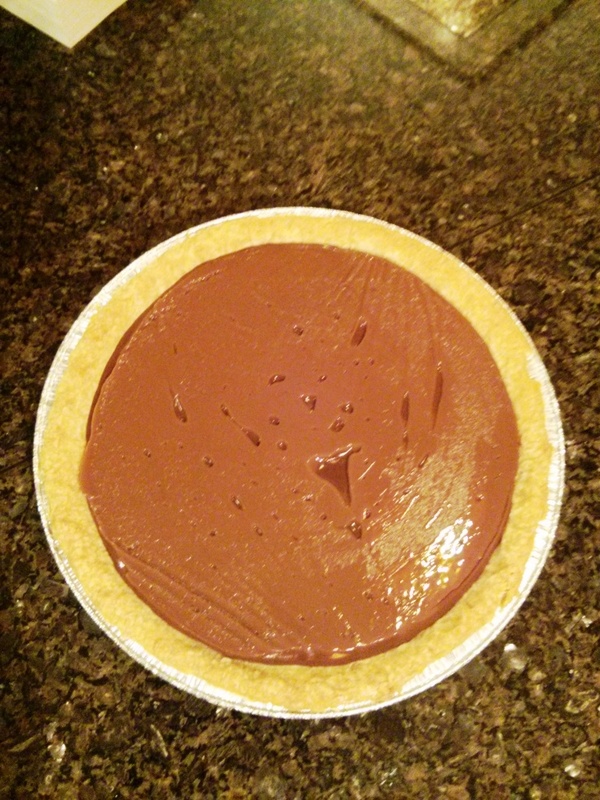 Didn’t get around to the backer board but still had a great day.The pie turned out wonderful and tasted remarkable. And for all those nay sayers, Tenderflake pie crusts are as good as any homemade and a lot lot easier. We ended up babysitting Jackson as his pre-school had an incident of head lice and the day home was concerned. People panic. Head lice is a million years old, doesn’t hurt anyone ( a little itchy) and is not caused by bad hygiene. Both of our kids had head lice years ago. Good thing treatment has changed as years ago weird concoctions were applied and heads shaved. Jackie spent a hour putting baby oil on his scalp and fine tooth combing his hair. Jackson still has a small amount of cradle cap which makes checking for nits, nymph or actual louse a little more difficult. His is all clean with nothing showing. Victoria will wash his clothes and clean his bag from school and he should be fine. Just a matter of checking for the next few days for nits which are fairly easy to see. I think I am safe from lice myself. Jackie unfortunately is starting to get my man cold. You know how colds affect women. The cold is always so much worse. LOL. The TSX tumble lately is not fun. I would like it to just stay steady. If the oil stays at this level it is not god for the whole Canadian economy.I would like 14500 plus on the TSX and would like to see at least a one percent increase in the interest rate. Everyone understands long term but after 2009 to be where we are at now still hurts a little. I am spending that earned money everyday now without adding to it ( Jackie’s contract is a great thing) and would like to maintain at least a 5% return. At 5% we are save . PS +10 degrees Celsius today. Yahoo ! PS still coming soon the video we all have been waiting for. 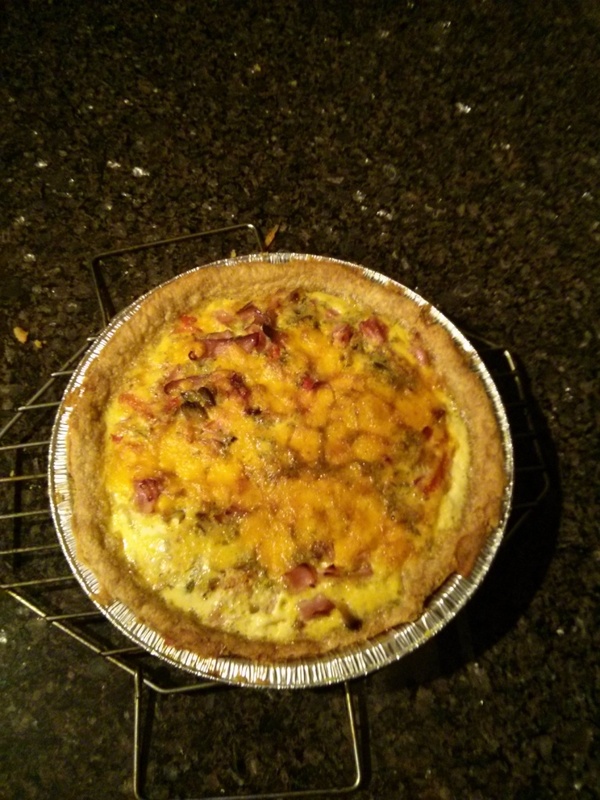 There is a saying “real men don’t eat quiche”. I have no idea why or how it came about. I am secure in manhood.Very secure . My next project is to make a quiche dish. Probably this Saturday or Sunday. 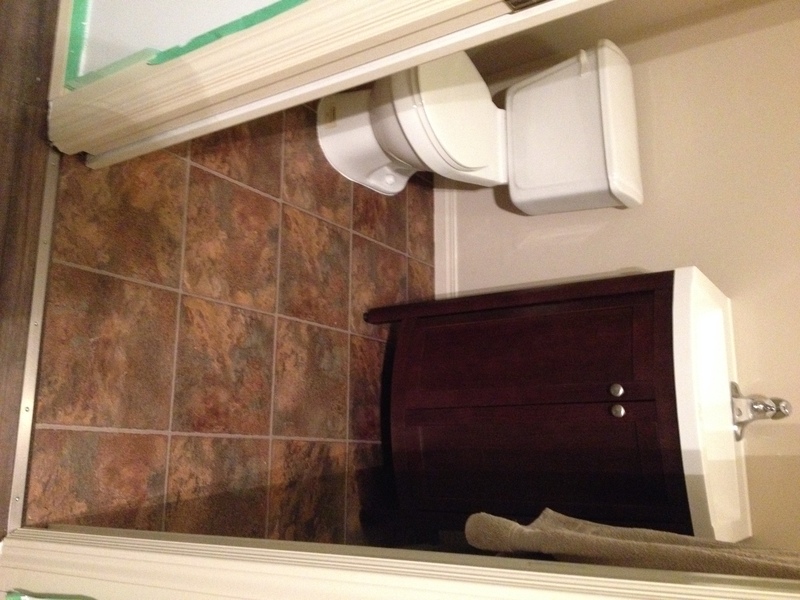 Today is an organizing day to get ready to go to Lethbridge tomorrow to finish off the bathroom at Jessica’s. Golf tonite with chicken wings and beer. Life is good. Figured out a few more gifts for certain people so that is nice to get that part done. Finding them is the easy part.I will go over to Victoria’s place this weekend to wire in their new pendant lights which will look great in their kitchen. This was always the fun time of the year with customers. Going out for Christmas dinners, company Christmas parties, years ago buying customer gifts and everyone is just a little more relaxed. I remember years ago Mark Henderson had me deliver to Jim Thorogood’s house out in the country a huge Christmas wreath.Jim’s wife would not let me leave there without giving me something. She ran and gave me a huge box of chocolate covered macadamia nuts that they brought back from Hawaii. Just nice people. I remember Christmas parties at Darrel’s place from HH Ft Mac at his house which were a lot of fun with his group of staff. Christmas calls at Midwest Lumber where you had to have garlic sausage,cheese, and a whole lot of straight vodka. In those days it was a good thing impaired driving didn’t exist. I remember Gary Leedahl actually losing his car after Midwest and trying to remember where it was next morning. LOL I use to deliver boxes of Chocolates to certain customers and lots of 26er’s to the other customers. I had some great Christmas dinners with very good customers over the years that were all fun. 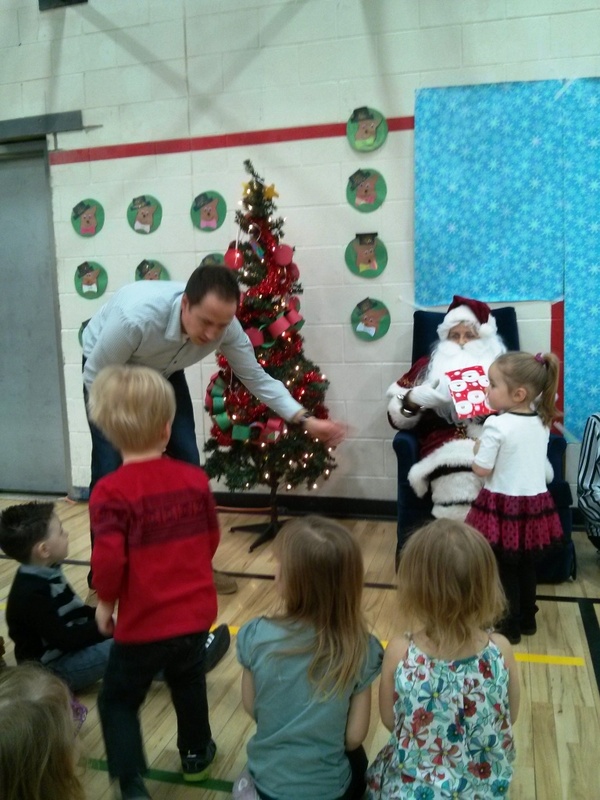 At my own workplace we had some fantastic Christmas parties. I personally believe that the staff love to get together for a party and it creates a bonding between all departments. I always organized Christmas parties and summer BBQ’s for my staff even if I had to dip into my own bucket. I had some excellent help in the organizing these with Terry Pepplers help , Ed’s help and the most help from Arnie who did a great job with all of the parties. We had over the years, house party, Shanks “mini Olympics”,golf tournaments, Yak Yaks, Bowling contests, pool tournaments and nice restaurant get together s. I believe it is important for the manager to make sure these things happen and it will result in a much more loyal, cohesive staff. The last few years Melissa had her birthday celebration the same time . Now that she is a way past 30 she probably doesn’t celebrate anymore anyways.The only struggle I had was trying to get the Edmonton staff and the Calgary staff together at the same time. A couple of years a few reps made it to the bigger party as in Calgary it was organized to have the sales group, service group and millwork group all together.Always fun. Now I get to organize golf outings and May long weekend outings only. LOL I hope everyone this year at JW has a great Christmas get together. Picked up the vanity, taps , mirror and flooring and am heading to Lethbridge in the morning. Got a good deal from Home Depot on a special buy promo they had. Should look great once the base and walls are painted in the bathroom also. Hopefully can it all done in the one day which should happen without any unforeseen issues like plumbing hookups etc. from the 30’s yet in combination with everything has a modern feel to it and makes the art really stand out. A glass of beer shortens your life by 1 minute, a glass of red wine shortens it by 2 minutes, and a day of work shortens your life by 7 -10 hours. Well a long day again. Up at 7:30 and off to Lethbridge and back home again by 11:30 pm. Managed to finish the bathroom . 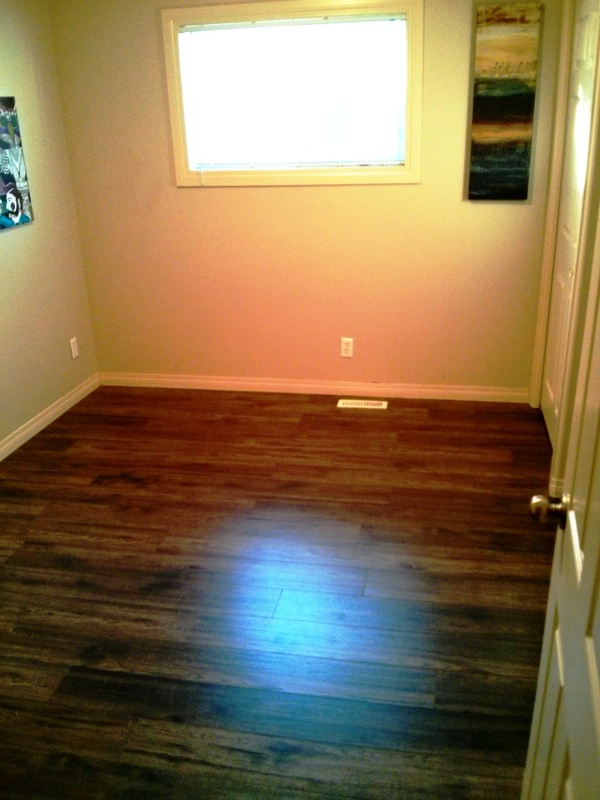 I got the flooring all down which looks fantastic. 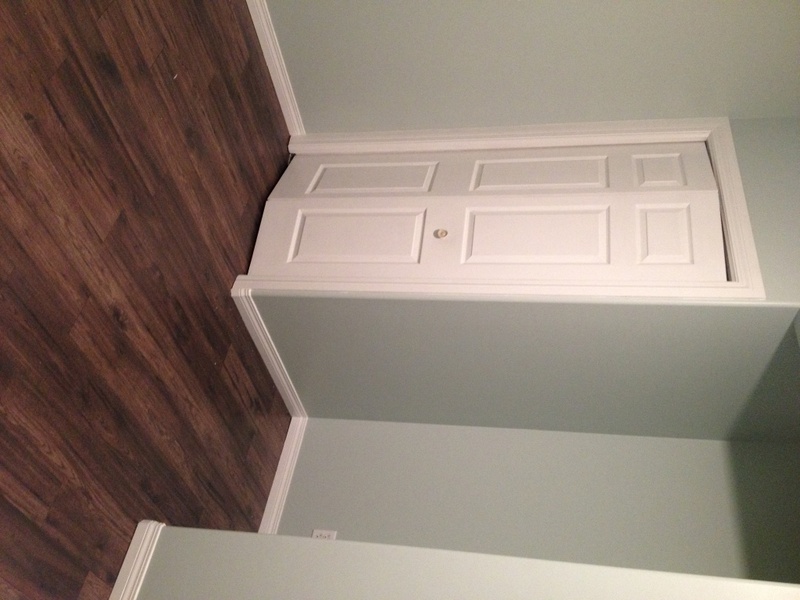 Had to remove and re-install all of the baseboards. Removed the old vanity, taps and medicine cabinet. Installed the new vanity and taps. Most difficult install I have done on a pop up and it’s probably my 10th I have done. As with metric the Chinese sink manufactures and the USA pop up manufactures don’t communicate. Some of the issue was my fault also as it was the first time to install a pop up I used silicone instead of plumbers putty. Some pop ups discolor from the putty so I thought I would give it a try with silicone.Due to the manufactures not having the same sizing the pop up didn’t have a lot of surface to seal. First try unsuccessful. PVC fittings should always be installed hand tight only. Second try failed using putty and wrench tightened the plastic fittings. Fail- the pop up broke. Good old Canadian Tire actually had the metal pop up with bass nuts etc. Extra putty and wrench tight and success. I cut a hole in the shelf for the plumbing so to redo each time is very time consuming. Glad it all worked out but I don’t care for issues like that for future leaks. If the sink design and pop up design had matched first time it should have worked. I also had to install a complete new plumbing system under the sink as nothing lined up with the new vanity. New extension, P trap,up right extension, longer water lines etc. The new P trap is nice as it has a clean out at the bottom to remove future hair clogs etc. New mirror installed and all that is left is paint. It already looks great. Today I slept in a bit and am going to a lot of nothing. Lethbridge’s snow is all gone. Looks like summer there. I could make that trip in less than 2 hours if we didn’t have the want to be cops on the road. Tonite is my quiche night. I will see how that works out. Have I said lately how much more fun it is not to have to be a workplace each day and everyday now is different and can be what I what it to be. LOVE IT. 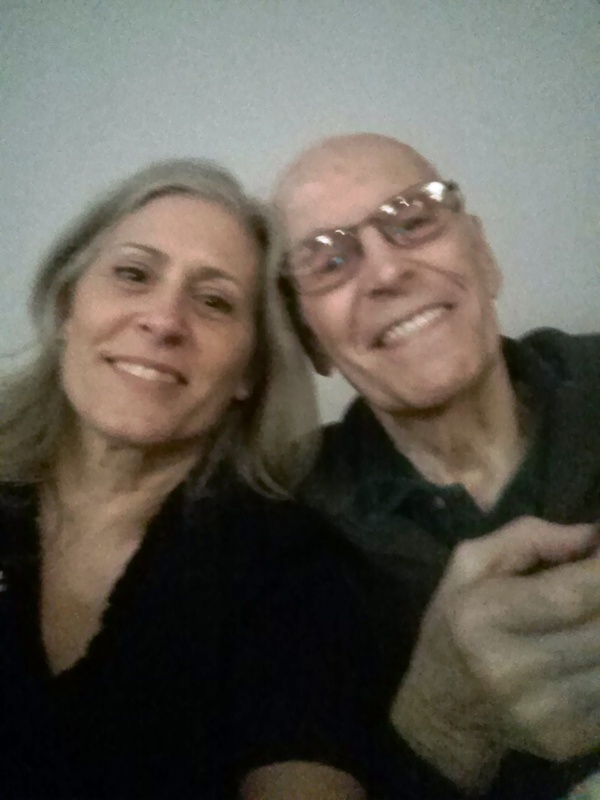 Jackie went to her Dad’s Christmas party at his home. It sounds like they had a great time. Jackie took a not so good selfie of the two of them. Everything is camouflage today so I found this quite fitting. Will I did it. I made my first quiche dish for supper and I will say it was amazing. The saying ” real men don’t eat quiche” came from a 1982 book that was a satirical look at male masculinity. The reference was that a man that ate quiche instead of beer and bacon would be considered wimpy. As I said before I am very secure in my manhood. ( as I look down and smile) so eating quiche was no big deal for me.Warning though: Any man that is unsure, not confident, challenged in certain departments DO NOT EAT QUICHE, t is not worth the struggle to maintain their ego. This dish is amazing and is basically a omelette in a pastry. High in calories but exceptional tasting. I foresee additional manly quiche dishes in my new metro- sexual existence. ( I had to trim my chest hair as there were a way way to many grey hairs) I could try for the new lumber- sexual existence but I don’t have camouflaged , plaid , cargo or a beard. Anita Geddes has given me a great idea today. For the next 12 days I am going to post a Christmas cartoon depicting the chaos we all experience around Christmas, eating too much, drinking too much, shopping, spending too much, and forgetting the real meaning. A shopping day ahead of us and then off to babysit Jackson tonite as Corey & Tor are going to a Christmas party. The TSX tumble is not good. Every drop reduces the amount of income available. You have to be invested in the stock market to get the required growth today due to low interest rates but a 1000 pt drastically reduces the principle. We have changed to a much different high risk percentage than before which helps but. A drop can be good if you are still investing as you can buy low and get some great companies stock at a reduced price but when you are stagnant with inputting money and only withdrawing it hurts. Jackie is going to invite her Dad for supper tonite for a routine change for him. I think I will create a master piece Cottage Pie and Salad for supper. I will add my secret ingredients to enhance the flavor a bit.Always fun to make it your own and you know a recipe is just like a speed limit sign and really are suggestions only. Today I don’t have a lot to do. Present wrapping is very easy . Cottage pie only takes about 1 hour. House chores mostly done. Victoria is visiting friends today so can’t install her pendent lights.Jessica is still painting and according to the new pictures the place is starting to look fantastic. Jackie is going out to lunch with some girl friends so I have the house all to myself. 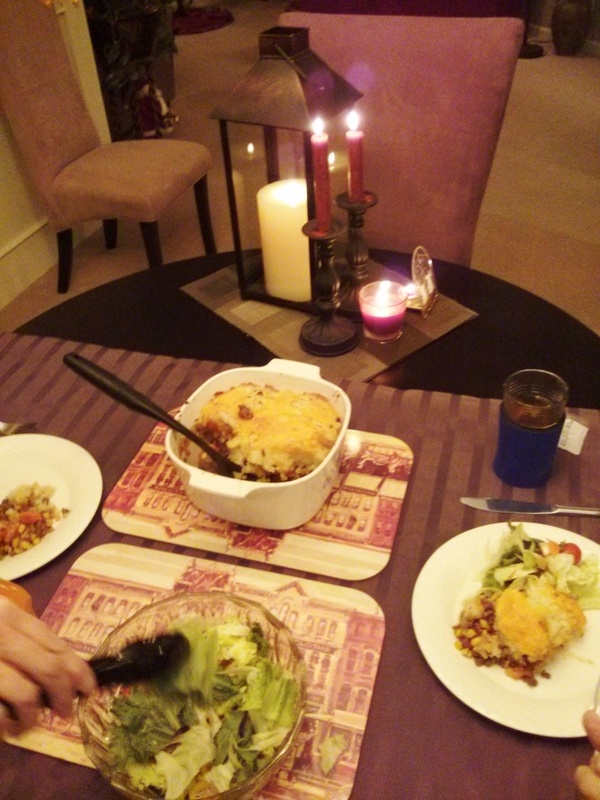 I created the perfect Cottage Pie and it tasted wonderful. Now some of you are wondering what is Cottage Pie. Some people incorrectly refer to it as Shepherds Pie. This includes a lot of people from the UK and Ireland where the dish was created. The term Cottage Pie has been around since 1791 when the potato was being introduced as an edible crop affordable to the poor. ( “cottage”meaning a modest dwelling for rural workers) The other term Shepherds Pie did not appear until 1877. Unfortunately this term is more popular and is used no matter if made with beef or lamb. The theory behind Shepherds Pie ( lamb based) is that Shepherds are concerned about sheep and not cattle. ( the UK and their love for sheep, but I won’t go there as it is just too sick) But here is one to remember . What do you call a guy standing on the corner in Wrexham Wales with a sheep under each arm ? Based on the original recipe and amazingly good. I used the traditional recipe with a few spice twists but simple, and original is always the best. While making this I also discovered the Queen gave her blessing to Lea & Perrins Worcestershire sauce and is a needed ingredient. We had Peter over for dinner and everyone thoroughly enjoyed the meal and company. He was in very good spirits and quite talkative which was nice. Mary had a little sheep, with that sheep she went to sleep,the sheep turned out to be a ram– Mary Had A Little Lamb ! And you guys wondered where all of these old British songs originated. Got up and had our normal fruit smoothies again for breakfast. Love these things. Went out this morning to finish off my Christmas shopping and all went well which is good. Picked up a few screws which are special sized for my restoration of my Grandads’ Grandfather Clock. 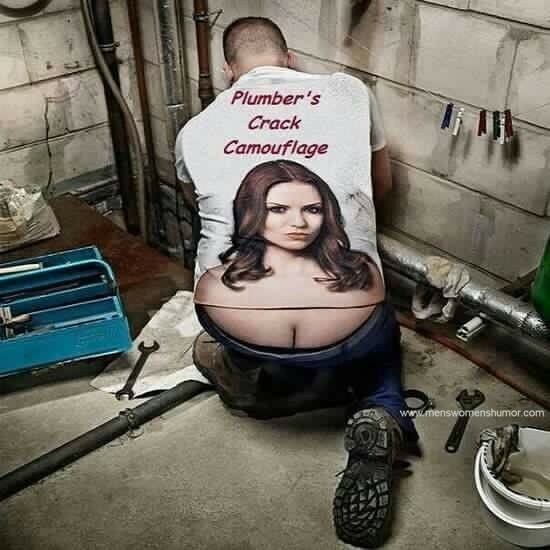 I will improvise as some sizes I need are not available. I have a far amount of modification as I am switching the mechanism over to a electronic cuckoo system. I got home and found a small visitor. Turns out Jackson’s day home caregiver wasn’t feeling well so Jackie picked him up. You know babysitting is tiring. Jackson is an exceptionally well behaved boy but the energy needed to play a different game every few minutes wears me out. Fun times though. So I didn’t get any work done today on my clock. Hopefully tomorrow I can get it done. 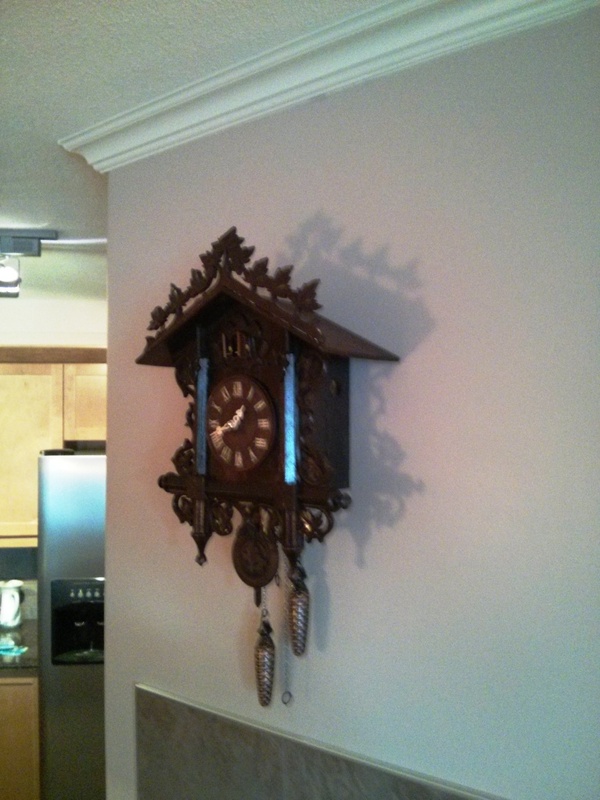 It is a 130 year old clock and is special as a long family heirloom. Can’t wait to hang it on the wall. Having a 3 year old is like having a blender without a lid. A Jackson babysitting day as his dayhome care giver still was not feeling well. I picked him up from his preschool and we decided to go to the Telus Spark Science Centre. This is a special and amazing place. It is on the pricey side for entrance but worth it.It is designed as an interactive science learning centre with a lot of hands on things to do. We played on the large play centre, climbing wall, water playground, played a piano to make bubbles come up tubes, played on a gravity wheel. We had lunch in their cafe which is on the expensive side also. We played with numerous interactive games. We actually got in trouble with a young staff member working there. Jackson and I were making guns out of wheel and sticks. Seems like they don’t like people making guns. I explained gently to the young girl, guns aren’t bad, guns don’t kill people and that it is the person every time that does. We continued to make guns as the young girl decided to walk away. What little boy doesn’t want to have a play gun fight, play cowboy, play policeman ( still a lot of little boys all grown up playing cop) play fights etc. It is a natural thing and in the right context is a teaching and learning mechanism for young boys. 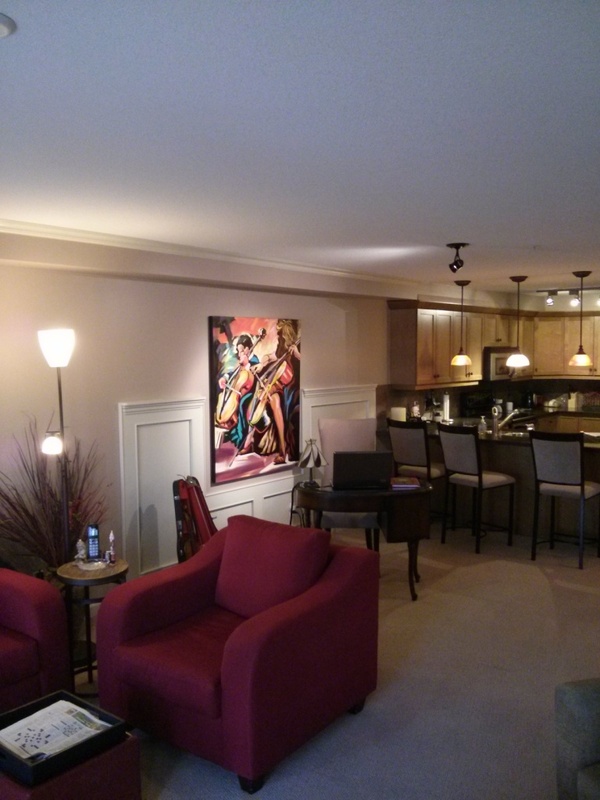 I received pictures of the final product of Jess& Pen’s renovation. The bedroom looks fantastic. 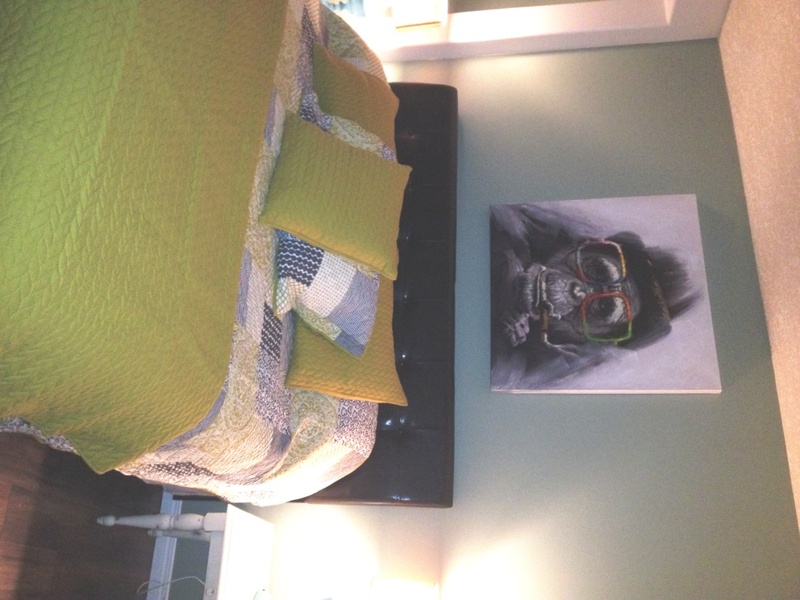 I love the monkey and the patch quilt. Good job ! What a difference ! It is a sick world we now live in. Taliban killing 132 children in a mass killing. ISIS shooting unarmed civilians,a lone wolf taking hostages in Australia, the killing of a soldier on our government property, school shootings, embassy bombings, bombing everywhere, and protesters in every country. It is amazing how many awful things are happening in all parts of the world. We as a society have become too tolerant of rights, to liberal in punishment, to lenient on crime and are trying to appease everyone. Our governments have to take a stronger stance. One of my Thought of the Days was “we will only be the land of the free if we are home to the brave” A very strong stance has to be taken. History has shown us that every great empire crumbles at some time. Greed and tolerance destroy them. Very very strict rules need to put in place if the Western World wants to stop the chaos. We have become a much more tolerant society that has resulted in a much more violent society.Let’s hope we can find a solution that makes sense to correct our misguided path right now. Luckily it is Christmas time and we can concentrate a little more on all of the good things happening in the world.We are very very blessed to be living in this part of the world. I hope everyone does a little something to help people less fortunate then ourselves. Even give the guy outside the liquor store a few bucks. Yes he may buy liquor with it but he will be content and you can feel also that you made his day just a little bit better. Play the pay it forward game this week at Tim’s drive thru or McDonalds. Give to the Kettle ! Help someone ! Watched the Voice last night and Blake Shelton’s original song and contestant won again. Blake was quite a winning streak on this show. I was sort of hoping for the other guy as I believe due to him being distinct he could be a rising star instead of just another country singer. The humidifier is working great at keeping the RH around 30 percent which should work good for flooring. It is a little noisy but does stop static and makes breathing a lot easier. Today is also Jackie’s little brother’s birthday. The thing is, he is no longer the little brother but just a little younger but old old brother. Very serious. I have known Alan since he was 12 years old. We used to take him camping with us, allowed him to have a few to many beer,other somewhat questionable behavior and bring friends along. Yes we used to allow him to have fun by getting dirty, not needing a shower everyday, not brushing his teeth every moment , letting his hair go wild, playing in the fire. Yes camping ! A few memories are going to Buck Lake just the three of us and catching over 75 Jackfish in the one day, playing Intellivision for hours and me never letting him win, playing ping pong for hours without ever losing to him, him wearing pink sweats and helping vacuum the floor,him not letting go of the rope when water skiing and just about taking out the dock,more Intellivision losses by him,him wrecking a great looking Chevelle, having him stay with us quite a bit,the three of us squeezing into my Corvette for trip to Saskatoon and then he changed.No more camping, no more getting dirty,no more fun, having to walk to the washroom with his toothbrush in his mouth to avoid germs, won’t drive on the roads if there is a skiff of snow or a 1% chance of a storm,no hair to comb,a little delusional supporting the Oiler’s, and moving to the far north side of Calgary ( the bad side of town) . It is a shame what happens to certain people when they age. We lost the young funny,carefree, fun loving, pale though, guy to an over serious, overly cautious ,penny wise,frugal, slow eating old fart.Still has a sarcastic humor about him that is heredity. But all said he is still Alan. Happy Birthday grasshopper. Lots of wipe on wipe off to be taught as of yet. Here are a few pictures that prove a few things for me. First is proof he did like camping and getting dirty. Second I think you all will agree that he has lost his spontaneity and how to have real fun. Third the cautious very thoughtful Alan just pondering if he should have another cherry tomato and lastly proof why I never let him eat quiche . I think you all will agree . One more time Happy Birthday Mel ! Proof he once liked camping and getting dirty. This one is for Alan. Always laugh when you can, it is cheap medicine. It is a bit premature but the weather forecasters are all saying we are in for a brown Christmas. That doesn’t happen to often. 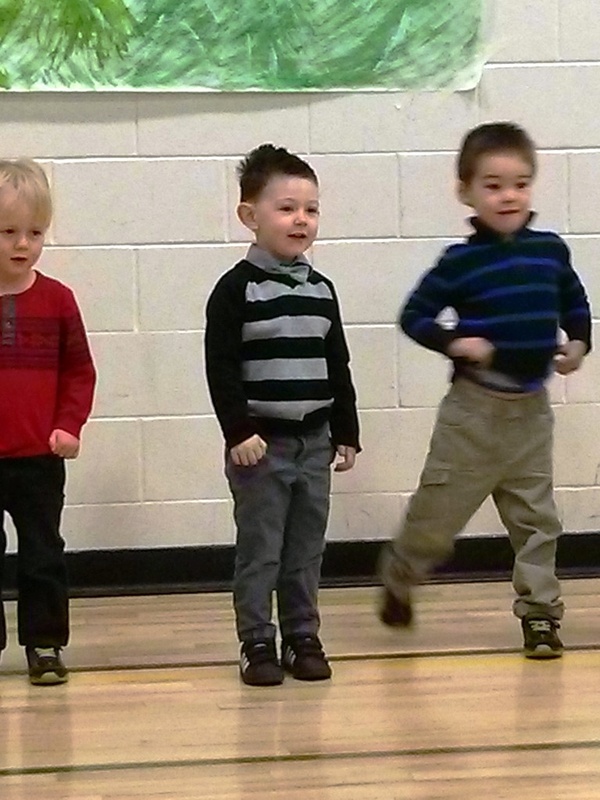 This morning is Jackson’s Christmas concert. This things are always fun to watch and the kids love to have an audience.They had lots of food out there for us, tables to decorate gingersnap cookies and candy canes, blow up Christmas houses along with a visit from Santa and the singing concert. It was a lot of fun. On our way out to the car Jackson says ” Why was Santa a girl?” They had a lady dress up for the kids. A 3 yr old figures this out you know you aren’t fooling to many people. Clever kid. Jackson did very well singing every song and remembering the words and actions needed. Others not so much ! Rhett Warnerer’s kid is in Jackson class. Rhett was there with his wife. I believe this is one of Wendy Grace’s relatives from Saskatchewan. All of the kids had a good time and it is pretty neat seeing the difference’s of how each kids acts and behaves. I will work and hopefully complete my clock project today. I think about two trips to the Depot and a couple of hours and it should be done. I finally had a chance to work on and I completed my Granddad’s cockoo clock. This one was made in Czechoslovakia and as close to the date as a old watch repair guy could get based on the mechanism was around 1850. I have refitted it with a electronic time piece and cuckoo bird.A lot of work as nothing fit and trying to squeeze everything in was difficult. I had to fill a couple of large cracks, glue on support beams for some of the leaves but overall the clock looks great now all stained up. I have one hiccup I will work on tomorrow as my bird won’t leave his nest and I believe I may have to enlarge my new hole for the pendulum a little bigger. The main reason Santa is so jolly is because he knows where all the bad girls live. And he won’t show his list to anyone. Went and finished off all of our last minute Christmas shopping. Picked up some appetizers for a Christmas party we are going to on Friday night and then home to complete the wrapping. I also completed my task of adjusting and adding a drop down box for 2014 and 2015 with the months for this blog which works out perfect. It was just a matter of figuring out their hierarchy system and order sequence.I worked on this for a bit then finally figured it out. Yahoo ! This is one of my pet peeves. As I said before we keep trying to appease everyone but it ends up hurting us. It is Merry Christmas not Happy Holidays. The second saying was brought about trying to remove the Christ out of the season. Christmas unfortunately for a lot of people has only become a holiday and is about Santa and presents. Our schools aren’t allowed to teach the meaning of Christmas and the attendance levels of church’s are not what they used to be. 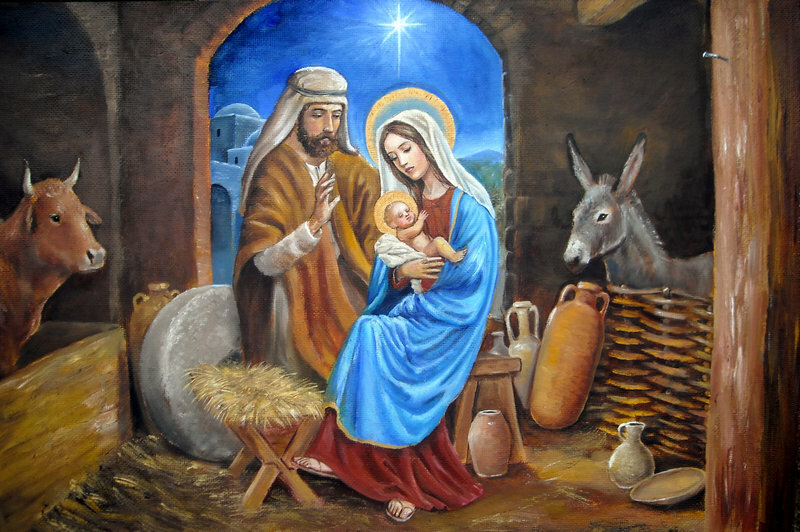 I think as parents we all need to make that special effort to reiterate the meaning of Christmas and not fall into the marketing and non secular propaganda of it only being a day off work and holiday for most people and to buy gifts for everyone. 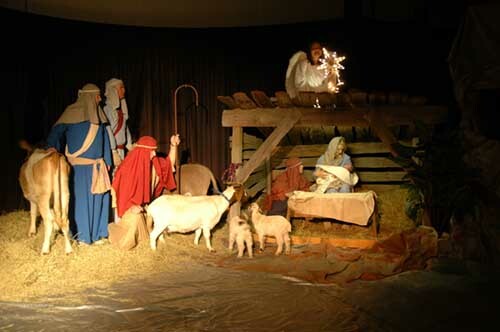 We can’t be afraid to say Christmas or explain the birth to anyone. Everyone has their own ideas and beliefs which is great but we shouldn’t allow them to change us or our system. Try it next week and say Merry Christmas to everyone. I am sure they will not be offended. I think I will send a Merry Christmas wish out to everyone on Monday as a lot of people will be taking off early to go visit family or friends. On the agenda for today is a quick adjust on my clock and fiddle and fart around all day until party time in the evening. To bad it is so far up north as Ron’s place is very near the C.O.P Park. Started working on my clock again this morning . Enlarged the new pendulum slot. This wood is like rock, I guess from being 164 years old it is allowed. Got this done and hoopla the pendulum is swinging like mad.Next was the bird. I took apart and put back together the bird including having to pull apart it’s plastic housing at least four times. I finally discovered the issue and tried to correct it with Jackie’s help. Unfortunately the wires used to open the door aren’t made of American spring steel and snapped plus due to the thickness of the case are a little on the short side. So I am checking to see if I can buy a part. So the clock looks great, pendulum works great, keeps time, the chime works, the bird leaves it nest and spreads it wings, and it chirps on the hour but the doors don’t close. Darn. Soon hopefully. So in the meantime the doors will remain open to let the bird sing. I may check a hobby shop also as they may be to help with the parts. Love the clock though. I love the cockoo noise and the looks of it especially since it was my Grandad’s. Jackie finished all of the wrapping last night which is great and we only have one present left to pick up on Monday for her Dad to give to his care givers. Car wash time again today. Between the slush and worst yet the salt it needs to be done very often. I would be for NOT putting down salt. Let the drivers learn to drive on ice. ( ps plus I won’t be here much in the winter LOL) . 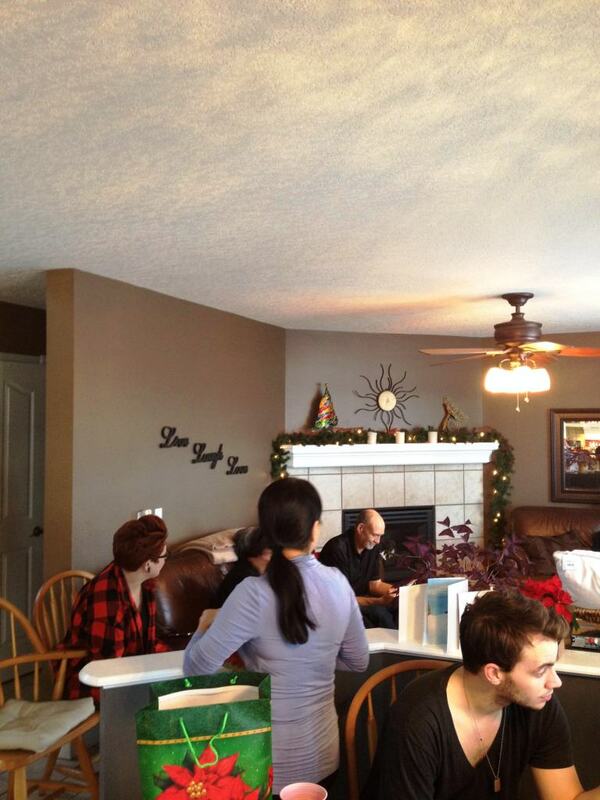 A great Christmas get together at Ron’s place. Very nice people and interesting as ex-bankers and current employees the conversation was somewhat concentrated on bank people and situations. Some funny moments with good food and drinks. Didn’t get home to late as we probably hit the bed around 1-1:30pm. Slept in today due to the late night. Had our breakfast smoothie. Not a lot on the agenda today. We have to go out to get groceries for tomorrow’s Christmas dinner with the kids, a little tidy up and that is about it. Perhaps studying and focusing on watching a golf game today. LOL . Maybe a short trip to Home Depot for one more 1930’s style spot light for one of our Tarkay paintings. Made another loaf of banana bread today as we had brown banana’s and guess what I had the time. Turned out excellent again. Did some house cleaning and relaxed a bit. Communication is a funny thing. Overhearing a conversation on the phone today that Jackie was having I have two commitments I didn’t know about. How does that happen? I was surprised ! A commitment you really would like or want is a great surprise the other scenario not so much. Every family has at least one weird relative,hopefully you know which one or how many or you may have to look into the mirror. A very busy day ahead as we are early celebrating Christmas with Jackie’s family and our girls. First in the morning at Alan’s place a way up north in Calgary ( they still may have snow on the ground there I will need to dress appropriately) and then our girls at our house for supper than over to Victoria’s for desert and gathering. Will be a fun day and with lots of food to eat. No snow outside what so ever here as I look outside. We will see how much snow northern Calgary has in a couple of hours. Weather predicts now a brown Christmas. It has been a wonderful fall really and with winter just starting today a great winter so far. Makes it very nice for anyone travelling. provided a great meal that everyone enjoyed. A bigger group than normal as everyone from Jackie’s side was there except Victoria as she was sitting in the medical center to see about her enlarged tonsils and not feeling well. Dave & Kristen along with Kennedy & Brenton didn’t stay very long though. We had Corey, Jackson,Jessica, Penny,Alan, Maryann,Jackie,Larry,Peter,Audrey,Michael,Danielle,Carter,Kennedy,Brenton, Dave and Kristen in the group.Along with the Christmas we had a cake to celebrate Alan’s birthday. Both Alan & I received these miniature toy cars for Christmas. I had to do some finagling and switched out to the Camaro from the Vette. 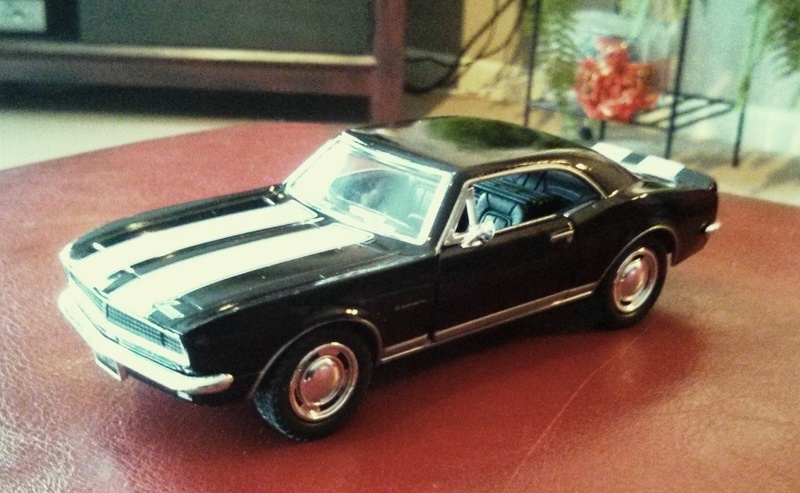 Here is a picture of the toy car and my favorite car I used to own. To give you an idea of the rarity of this car– in 1967 only 3% where black, to order the white striping packaging even more rare and to have a black with white stripes with the RS package even rarer.Today a $150,000.00 car. And they made it as a toy !!! 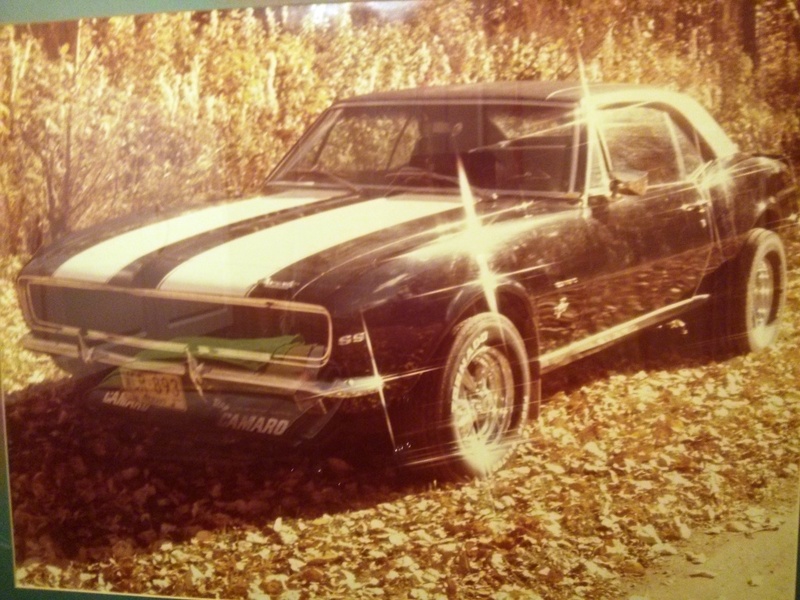 My 1967 Camaro RS/SS Black, white striping,front rotor brakes,rear folding seat, 12 bolt posi rare rare factory options. My all time favorite car even today. I like the body style more than the favorite 1969 style that everyone else wants.It is the only year Camaro made with vent windows .The only year where they used a single leaf spring and designed a factory traction bar option. The folding down back seat was an extremely rare option but came in very handy as a young guy. Nudge Nudge wink wink. Often thought about buying another one when I was in my 40’s and 50’s but just never did. Victoria going to Lacombe and Jessica going to a small town near Regina. So we all have a bit of travel to get done. Almost forgot. At Alan’s house in the north of Calgary it was like going to a a different city.The roads were snow covered, the lawns were covered and small snow piles on each side of everyone’s driveway. It is amazing the temp difference and the weather difference between the two areas of the city. In Cranston you will not find one drop of snow. On the way though I figured out the why of the difference. They are very close to C.O.P Park. If you think about it you put a ice cube in your drink to cool it down, the skiing hill is the ice cube for northern Calgary. Makes me happy we choose to live on the tropical side of town.Never mind the traffic up there !! Think about this- Santa, tooth fairy, Easter bunny, sandman, boogie man, ghosts,Old Man Weather, Mother Nature— it’s a wonder our kids ever trust us. Well a wonderful Christmas weekend for us. Getting together is always fun but it is to bad everyone is in a rush to be somewhere. Not for Jackie & I though as everyday is Saturday for us. great job and know their stuff. A great company that just can’t seem to find it’s way.It is a Christmas where no one of the group has travel plans this year. Nice to see the group before I head out in 6 days and won’t be back until May. I hope they all have a great time at the WRLA in Calgary this year. I will have a cold beer on my deck in the 30 degree weather as a salute to everyone’s efforts for those three days. I used to hate the timing of the WRLA as it was always held the same time as the Barrett Jackson auction in Vegas. Now I can go to Vegas but don’t have the money to buy the car of my choice. Funny how things change. Headed over to the rental house for measurements and then to Lowe’s and Victoria’s. I picked up a piece of mdf, towel bar and some fasteners. I tried using my laminate router but couldn’t make it work as I had no adjustment so I used my big 3/4 hp plunge router to put an ogee mold around the outside perimeter. This wasn’t as easy as I would have liked as I was missing a lot of needed things like a workmate with clamps etc. But got it done, turned out great and headed to install them. Typical framers ( why builders don’t ask for a 2 x 6 backer board where towel bars are being hung is beyond me) as the studs were 24″ on center and I couldn’t come close to catching one. My backer board looks great and I was able to screw into 2 studs plus glue and wood screw in the bar brackets they should be able to chin ups on it.Tomorrow I will fill the the screw holes and paint it plus install an access panel to the tub faucets. I also have to fix the ceiling as they have a spot where the texture is coming off.Couple of hours only I hope. Tired of working alone ? Do you hate making decisions on your own ? Off to the rental house this morning to complete my work there. After all of the eating and a few beers the last few days only up .6 of a pound. Work hard today and should be all set for Christmas coming up. 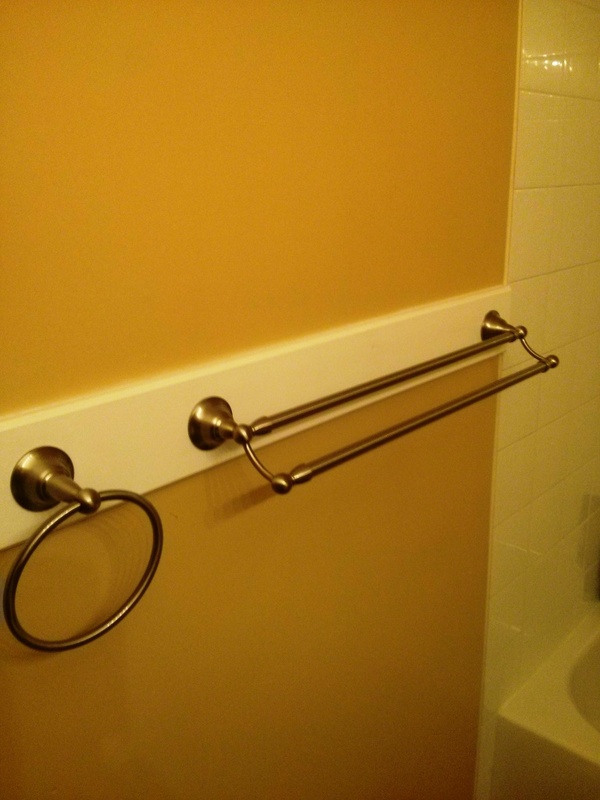 Best way to install a heavy use towel bar. Chin ups can be done on this. of the existing bar. 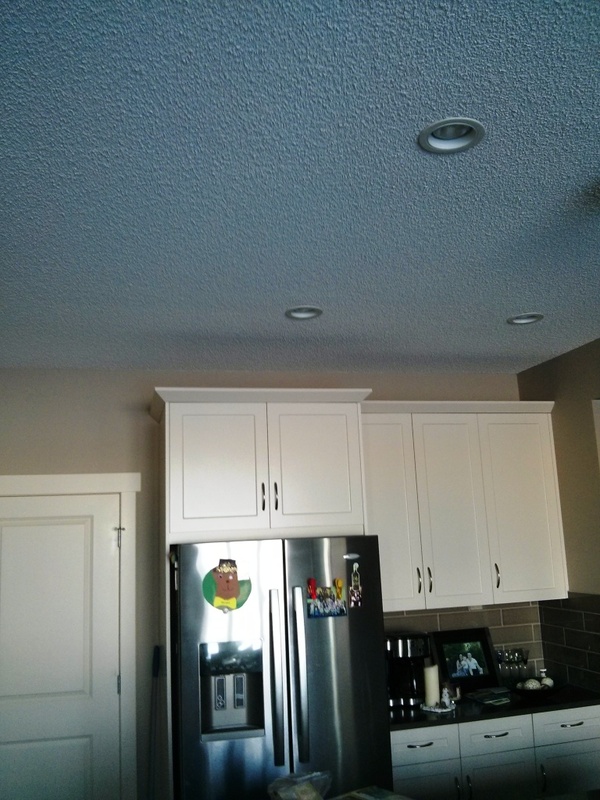 Much easier and will last a lot lot longer than patching in a 12″ by 36″ piece of drywall.And it looks good.Tried to fix the ceiling but as soon as the spray stipple hits it softens the texture and a piece fall down. I may try tomorrow an applied by spatula method. Installed the access panel to the tub plumbing, removed a whack of clothing out of the closet to be safe and painted another coat. Looks good and now allows access to the tub fixtures. Installed the towel bar, towel ring and hook right after another coat of paint. I had to rush the process as the spackle was taking a long time to dry. Hopefully no shrinkage. I arrived home after a car wash and vacuum of the Cherokee and our additional Tarkay painting had showed up. I hung that up with Jackie’s approval of placement. 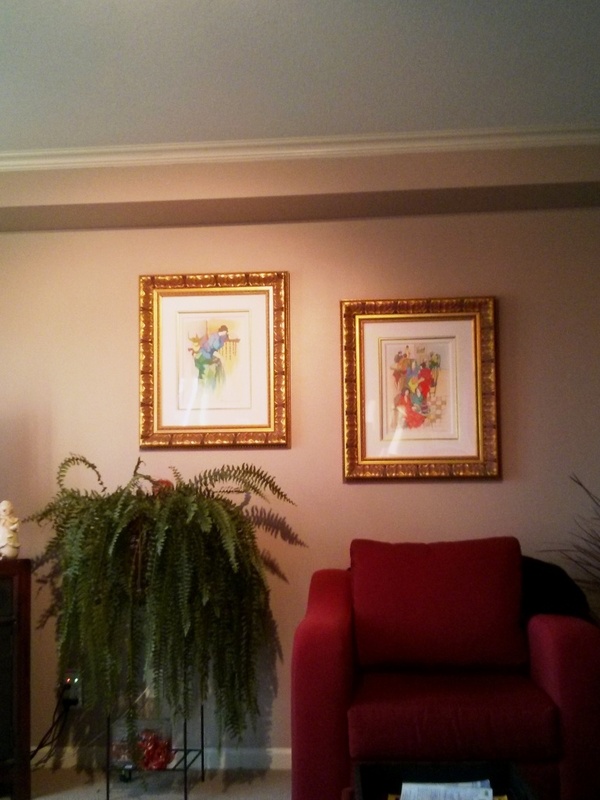 It is amazing how quality pictures and framing enhance a home. 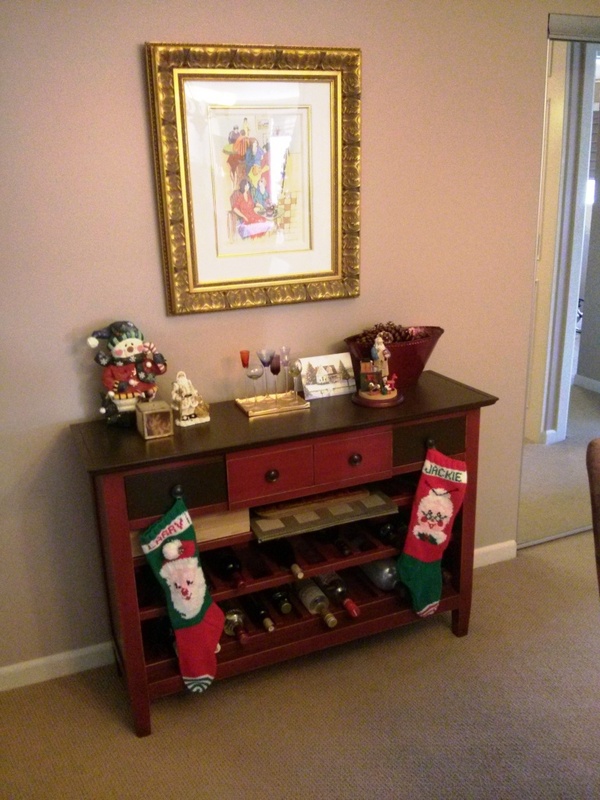 My blog will be sporadic for the next few days as we enjoy Christmas. Not a lot to do today. I will check on the spackle and perhaps look at applying a texture by hand. I will send out a Christmas message to everyone. I love the site JIBJAB but couldn’t access it with any free codes otherwise I had a great twerking video ready. We will be leaving for Edmonton bright and early in the morning. Merry Christmas everyone. My wish is that all of you have a wonderful next couple of days enjoying family,friends and food. My hope is we all remember the less fortunate people on this planet.My dream would be for everyone to get along or at least live peacefully. Love Christmas ! May the spirit of Christmas give you the key to every closed door; light to dispel any darkness in your life ,immense joy and fulfillment in your life, riches that you can’t imagine, favor beyond comprehension,good health and may God grant you and the world peace in these turbulent times.My wishes are that everyone of you have a wonderful season and many many more to come. A special day. We had a great visit with Michael & Audrey on Christmas Eve. A wonderful supper, the house was decorated nice and great conversation.The Christmas crackers were those expensive kind with nice gifts inside but are to difficult to pull and have them explode.I think we solved a few of the problems of the world that night but unfortunately that is as far as it will go. It is rather funny dealing with the British and Welsh. While keeping traditions, customs and loyalties is important you have to let your past go a little. Audrey and Micheal are so British they only watch British shows, read British papers, do British puzzles etc. And we all know the British humor.They tell a joke and you sit there wondering when the punchline is coming.LOL I love the fact they are so dedicated to their past. But to practice an accent in the shower every morning ! Come on. LOL It was a fun evening. Six cuckoo’s and we were up. 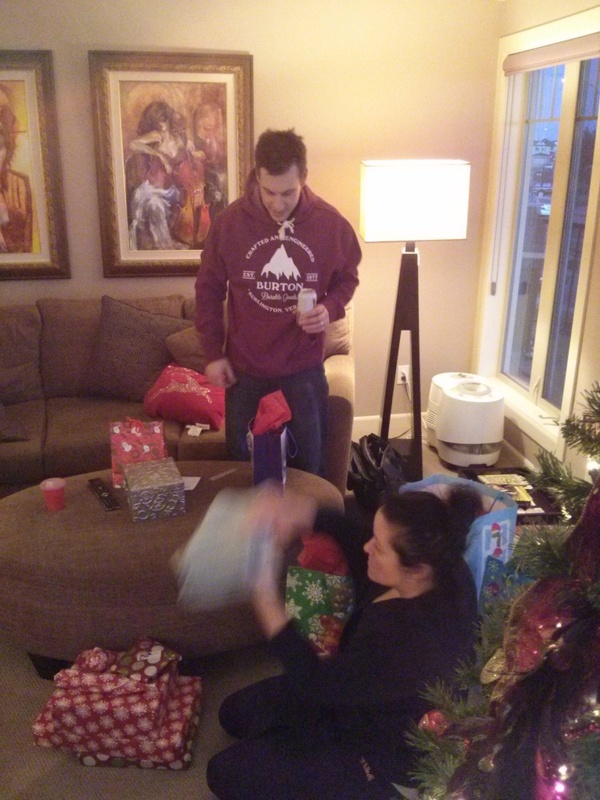 Opened our socks and presents. We each received great gifts. Jackie loved her new golfing attire of a animal print skurt and blouses plus she smells wonderful with her new Katy Perry perfume. ( trying to keep her young and not smell like a old lady LOL) One blouse has to be returned due to fit which we will do fairly quick. I received some excellent cargo pants and some great fishing gear. ( we will return this as I already have and will exchange them for a new baitcast reel) Had our smoothies and hit the road. Brown dry roads until Red Deer and then a white Edmonton. 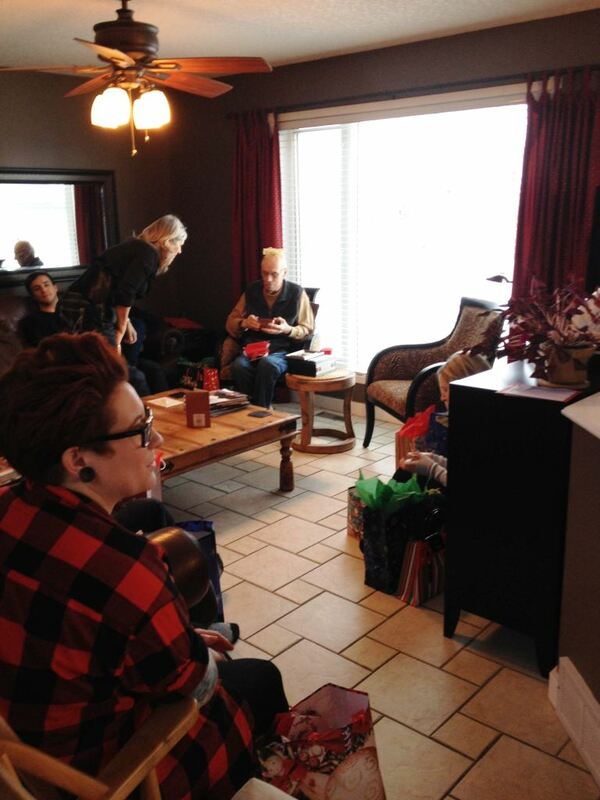 We then opened more presents at Darlene’s place with everybody receiving very appreciated presents. Suppers at Boston Pizza, movie tickets, chocolate covered Macadama Nuts , deluxe coffee’s and teas ,plus more. This year due to other family commitments we had only the immediate family with no small children. 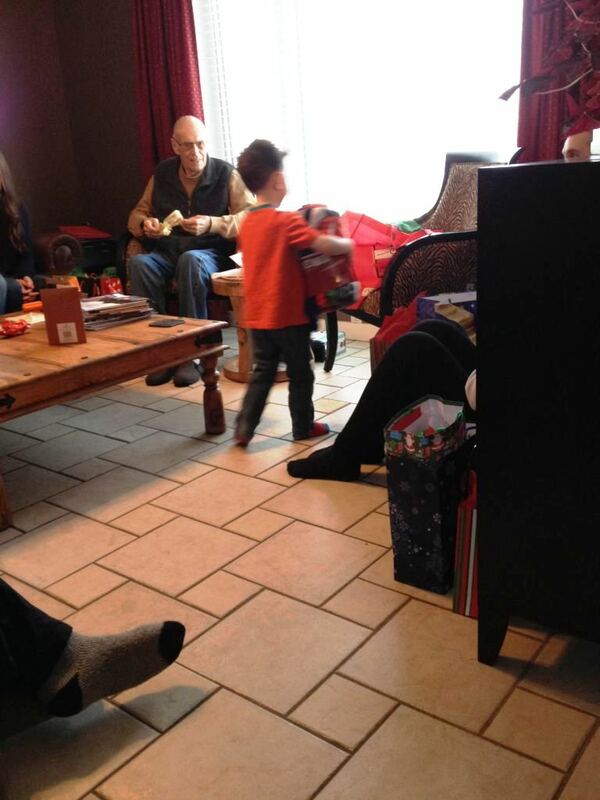 Now Christmas is all about the kids but it was sure nice and quiet this year. Alfred,Mary,Mom, Jackie and I, Jim,Darlene,Kayla and Kari were there. A FANTASTIC Christmas dinner. Darlene is an amazing cook and uses a lot of our Grandma’s and Mom’s recipes which in my opinion are the BEST. Turkey,dressing,ham,mashed potatoes,gravy,corn, peas & carrots, cranberry sauce, honey mustard sauce,cabbage rolls,buns,pistachio salad, and Christmas pudding. The dressing is the best I have ever had anywhere any time. Plus Darlene makes it look so easy ( we all know it isn’t). As we didn’t have our normal extra large group we were able to have a fancy sit down meal which was very nice for a change. Ate a way to much when you add the chocolate and shortbread cookies and the left overs for supper in the mix. You got to live though and will work at reducing when at home. LOL. We had a great evening of conversation, laughing , joking and telling stories. I think we got back to Mom’s place about midnight. This was the first time staying at Mom’s new residence. The bed turned out to be perfect and the temperature in the place was just right . Mom had warned us about the fridge and furnace noise. Jackie and I didn’t hear either. BUT Mom has two clock’s in the room and they click very very loud. Tic Toc. Some may call it white noise but it is very loud. Next time we will turn up the furnace to cover the clock noise.LOL I remember years ago staying in Keith’s 5th wheel where I had to get up to remove the batteries out of a clock to get to sleep. Very comfortable bed and pillows and her place is very quiet of outside noise. Mom made us breakfast in her suite and Jackie headed out to visit her brother and niece. Mom and I switched around a bunch of pictures, hung up some new ones in the bedroom and decided to go shopping to see about pictures for the living room and a coffee table. One thing I have to say about Edmonton. I love the diversity of culture in Edmonton. We were in stores where I am sure we were the only Caucasian couple in the store. A huge noticeable difference between Calgary and Edmonton.I do love it as it makes everything that much more interesting. We ended up with two large pictures for the living room that are perfect. I mean perfect. It is like they were drawn specifically for this room. After a few measurements and a long deciding moment we also bought a coffee table that fits perfectly in the living room and looks spectacular. Her living room is starting to look like something out of a magazine. I like the modern look of it as I was worried Mom may go for the old lady look but this room is young, fresh, and cool looking with brighter colors and some unique design features. I forgot to take a picture of our work. LOVE IT though. We then headed home and it was nice to see the brown grass and dirt again. Jackie and I both slept in this morning. Checked the weigh scale. HOLY CRAP it is amazing what 2-3 days of eating incorrectly can do. I have 3 pounds to lose in the next few days. Gym and restraint. LOL Jackie is going out shopping today with her Mom and I will watch Junior Hockey ,golf and relax. Another Christmas over. A fun time , a busy time ,a great time but now back to a normal time.Still considering when to go to Mesa. I may look at waiting to stay until Jan 9th to go with Jackie. Will save about 300 bucks or so. If I went it would be the first New Years Eve not spent together in 39 years. I will see but right now leaning toward leaving on the 10th. Hate the staying but will save some money, be able to spend New Years together and makes sense. By the way I am so glad the City of Edmonton decided to remove the City of Champions sign on the entrance to the city on Hwy 2. They could probably hear the giggling in the cars as they drove by the old sign all the way to city hall. Just looks better now and why would anyone want to give a reason to be ridiculed. The big two game series against the Oilers coming up. I am predicting a 4-1 first game win and a OT win next game for us. The weigh scale is still a little higher than wanted. Down .4 and should take another 2 days to reach my goal again. Nothing on the agenda today that is important. I decided today to wait and not go to Mesa until January 10th. It will save us a bit of money, I will be able to celebrate New Years Eve with Jackie, and we will be able to travel together. Looking at the weather today down south in Montana it probably is a good idea with Great Falls having a winter storm watch. Expecting 6 inches of snow and more thru the passes. Hopefully it will be better for us when we go. Hopefully Fred & Terry get lucky with the timing and snow. Spent the day doing very little. A very nice relaxing day. Plan to exchange a few gifts, go golfing to the screens, go to a movie and dinner on News Year Eve , go see my back guy, give blood and do a few things around the house. The few days I need to wait will go by quickly. I am very anxious to hit the real course and the patio for a cold beer. 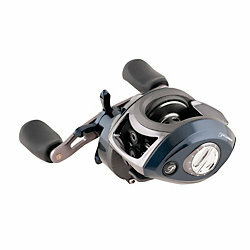 new bait cast reel. I choose a Pfleuger bait cast which I hope will be excellent.Choose baitcast also as I like trolling the best. They have been making reels since 1891 so they should know know what they are doing and by reading on line reviews seem to be great. Magnetic spool friction, 5 ball bearings and a auto reverse stop so that the line won’t bird nest on a cast. When I opened it though I was surprised to see “Made in China” I only found one reel manufacturer left in the USA or Canada. Built to spec so will be great but we really need to look at getting back some of the manufacturing in our own countries.I am currently researching a portable fish finder to buy for spring. Looks like a Garmin model at the moment. I only need depth, fish indication and weed indication and a transducer that has a suction mount. May look at Bass Pro in Mesa to price them out. A fish finder, a couple of cup holders, upright travel rod holders and I should be set. I plan to do a lot more fishing next year. Paid a few bills, looked at the budget but can’t complete until New Years Day. I think tomorrow I will install Victoria’s new pot light conversion kits. A woman who hasn’t seen her husband fishing doesn’t know what a patient man she married. Good things come to those that bait . Lots of hockey to watch during this time. Watched the Flames win again with a gritty performance and watched the Juniors win against last years champs. Watched a great movie late last night after going grocery shopping. I quick day past but didn’t do a lot which is just fine as I hate the cold snowy weather outside. Checking the weather and it looks like storms all the way down to Flagstaff and Vegas. Vegas is expected to get 3 inches of snow. This is a rare thing. The following week the temperatures will be back up in the 20’s and then we will arrive. Once I get to Mesa I will start to organize my next years events as we have a lot on the agenda and I don’t want to overlap any if possible. Problem is where people say they want to do something but don’t commit or follow thru. ( sort of like me not going to the south until the 10th,LOL) I think I will be able to remove a few items from my bucket list and find a few more to put on. Another project completed today. 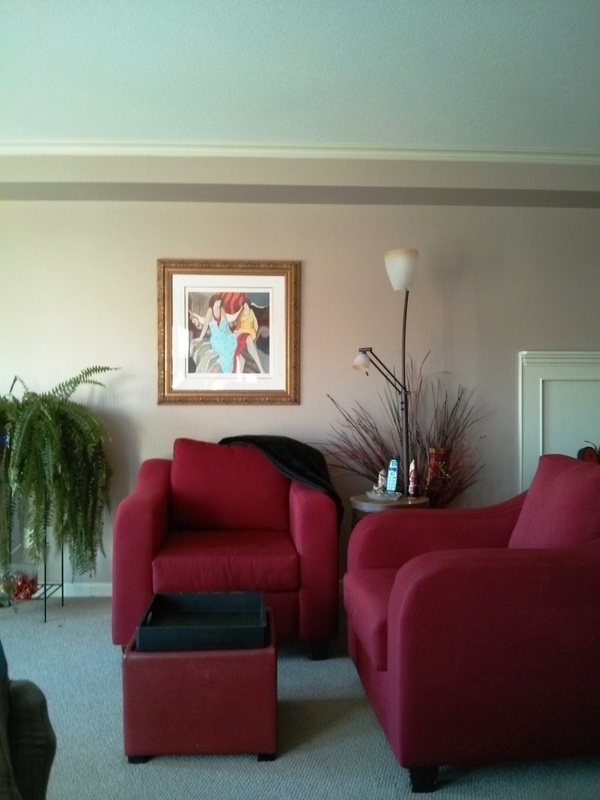 Here is a perfect example of how a $150 can totally change the look of a place. I wanted a Home Depot conversion kit for a pot light to regular light but as usual the McKenzie store didn’t carry them. These small Home Depot stores need to disappear. Why have a store that only carries half of the inventory. When they built the 130 ave complex a lot of stores took the smaller route. Canadian Tire has now added twice to theirs. Stopped at the Lowe’s which is fast becoming my main store to purchase at. They had a perfect kit and better than the one I found on line at the Depot. I liked the simplicity,quality and pricing. 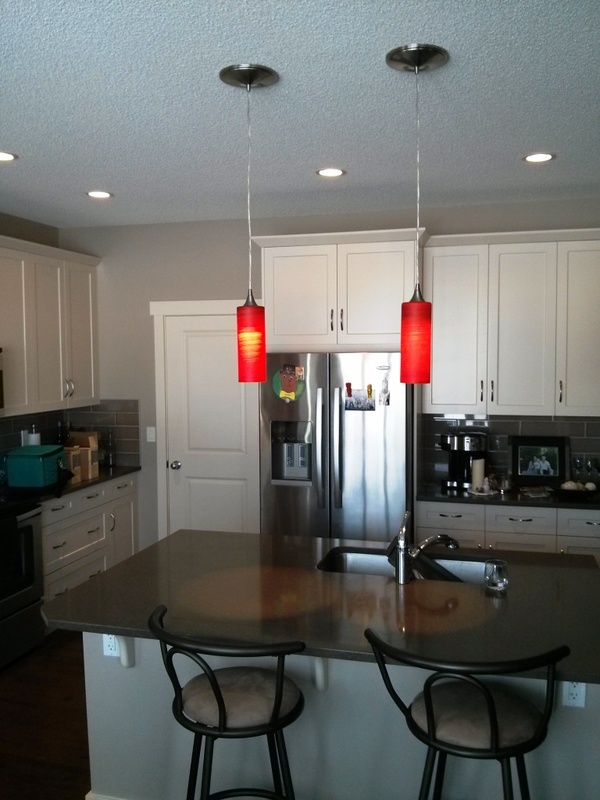 BEFORE :Excellent looking kitchen but no wow or pop ! The pendant lights are called Brown Sugar which is exactly what they look like when not lite up. But turn the light on and POP the Brown Sugar turns to Orange Delight. They look fantastic , the look is modern and orange is the new “IN” color for house design. A few place mats, a bowl, or vase with flowers to add cohesiveness to the color palette and vavoom ! When Victoria arrived home and saw her new lights she phoned to thank me. On the phone came Jackson ” Papa ( I like that name and voice that says it) Thank you for the lights. They are amazing” That kid kills me he is sooooo cute ! WordPress sent me my year’s stat’s on this webpage. Canada by far looks at the site the most but USA and Brazil pull a strong second. It has had over 4000 hits since March. They encourage connecting it to Twitter and Facebook but I don’t want to go that route. My surprise tape is still coming and think as it is a retirement based site I will add a new feature along with “MY RANT” and “Thought Of The Day “. worth while assets. I had the nicest car in Grade 11 in the entire school. 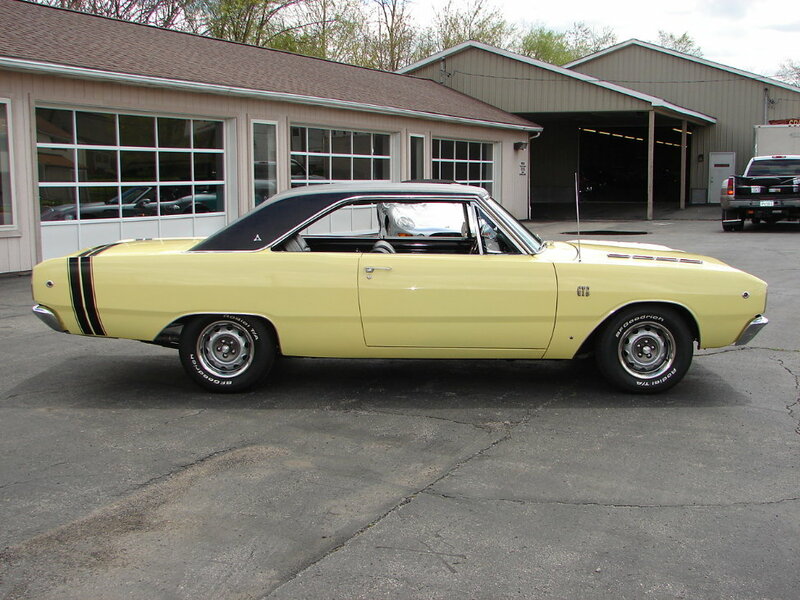 A 1968 Dart GTS with white leather interior ,buckets, Craig Stereo, and Cragar SS mags. Most guys were driving beaters or parents cars and this car only being 5 years old I was very fortune. I paid cash for it. Jackie and I bought our first house together before we were married and renovated the entire house.New shingles,new windows, new soffit and trough,carpet, baseboard, paint, tile, countertops, and even polished the hardwood flooring with wax the old fashioned way.It was a great starter.To buy a appreciating asset is a great investment or to buy something that creates joy in your life is a wonderful way to live. To have a wife that is on the same page makes things very easy. I cannot remember one fight over money, the saving of it or the spending of it. From day one we always had a joint account only. December 31st- New Years Eve – the end of another year ! Well today is a day most people review the past year. I was going to do Best of 2014 and the Worst of 2014 but decided why not only use the Best. The rest doesn’t really matter. Negativity breeds negativity and there will always be things that happen that aren’t great but just let them go. Enjoying Fred & Terry,Jeff & Wendy on a road trip to Sedona. A little nippy out as we headed out on a cooler day. 2014 was a wonderful year with a lot of amazing things accomplished and enjoyed. It was an incredible relaxing, smell the roses and enjoy year filled with a lot of great times.I am sure now with Fred and Larry both being retired 2015 will even be better for fishing and camping. I have quite a few items I want removed from my bucket list in 2015. The year flew by. Our demand for time is unlimited so often the supply often comes up short. As humans we have hard time perceiving time. In a single hour we can be off by as much as 15 minutes.Compare a 1 hour back massage to a 1 hour root canal. I think we all can guess which seemed longer. A study has shown time goes by quickly if you are busy and absorbed in something. It goes slowly if if we are thinking about how long something takes or waiting for. Enjoy your time even if it does seem to be short. Time going slowly would be horrible. Remember everyone drive safe tonight. Be extra careful.There are a lot of irresponsible people out there that you can’t control that we all have to watch out for. As I have said before the .008 is ridiculously low and needs raised but the idiots that drive drunk deserve everything and more that they get.I would like a skills test verses a blood alcohol test. To help here is some guidelines to drinking. Remember food, water for each drink and lots of grease to coat your stomach all help increase the quantity of drinks you can have. The annoying part now that I am lighter is my BAC increases faster. Muscle also absorbs at a faster rate than fat. 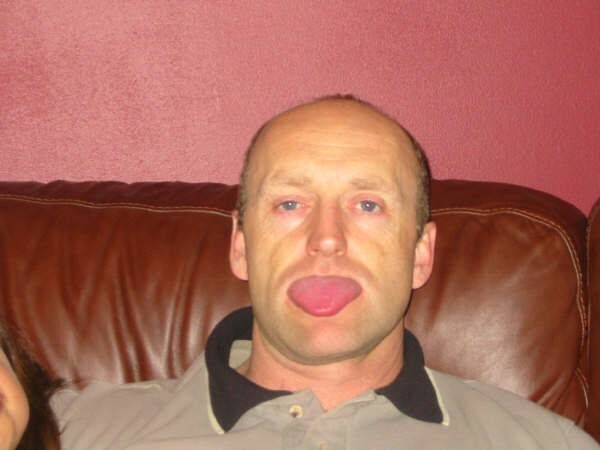 Ps Do not EVER admit to having anything to drink as that give just cause to make you blow. Let them determine by smell, eyes,or slur etc. If they have just cause perhaps you may have too much to drink . At my weight 4 or 5 beer does not alter my state the slightest.We also metabolize alcohol at .015% per hour starting from your first drink . Our New Years Eve plans are, I am going to meet Jeff at the bar to watch the Canada /USA game, then Jackie and I will go out for supper and then to a girly movie as I am just a romantic guy. Happy New Years Dad! I have enjoyed reading your blog and seeing what retirement is all about. Cheers to 2015 being even better than 2014! Love you lots! Enjoy your New Years ! Just a thought Larry… if you shop throughout the entire year, Christmas presents can be purchased when you find a good sale, or notice that “perfect gift” for someone long before the stores and malls (& parking lots) are crazy busy. I’m usually done by October and can gloat when everyone else is doing their best Scrooge impressions! You are good. I wish we were that focused. Finding that special thing whether in May or December is the issue. How many times have you forgotten you bought something and then still bought something else for someone or perhaps forgot where you put it. LOL Nope we wait and go out into the malls with the hoards of others to experience the joys of Christmas shopping. Oh my gosh, Jess and Pen’s place looks amazing!! Nice work! !